Checking out my favorite thrift store, the Blue Ridge Humane Society store, I found these beautiful Japanese rice bowls at one of my recent visits. I loved the designs on the side. 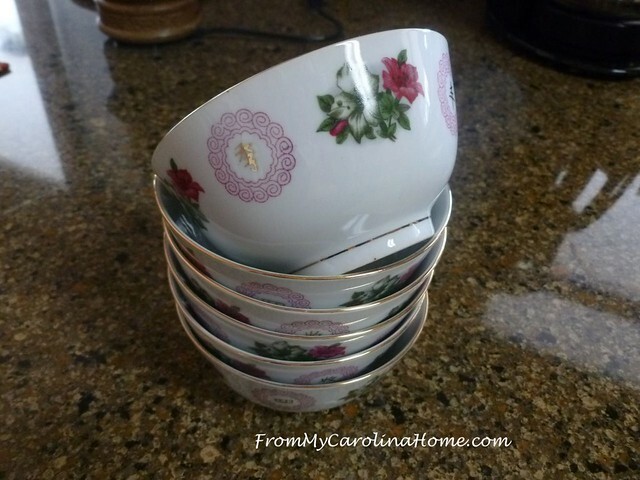 It is so much fun to find six of a pretty plate or bowl so I can use them on the big table. And I have to admit that my friend Carin is still right, I am not done with my Japanese phase yet, LOL!! While we were in Daytona, one day was spent with my dear friend who is just as much of a thrift store junkie as I am. We spent six hours in just three stores, they are really big stores, LOL!! We both tried on some clothes and found a few new-to-us things. For me it was especially good as I took the wrong clothes with me, and it was warmer than I expected. So, I picked up a sleeveless top and a couple of short sleeve tees. The fun piece is here on the lower right, a Japanese style print in autumn colors, what a perfect piece for me! I like sleeves that are elbow length. 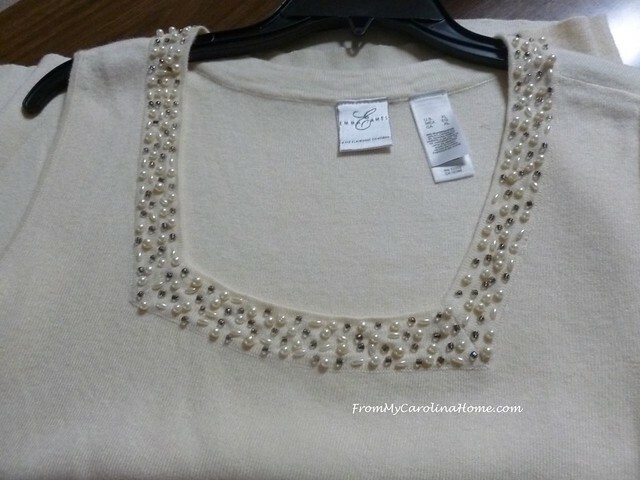 I couldn’t resist this sleeveless sweater shell with the pearl embellishments. Several of the pearls were loose, but a quick session with a needle and thread fixed that. 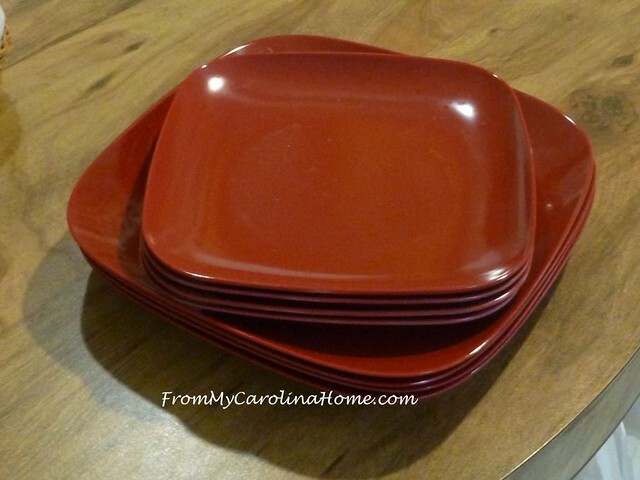 Some time last month at a local thrift store, I found these red square dishes. It was then that I had the beginnings of an idea for a Japanese Christmas tablescape. I think I mentioned that on my Podcast Interview. It is still a percolating idea, but I’ll get to it in December. It is time to start thinking about a bit of shopping for the holiday. While you are shopping for everyone else, treat yourself to some fun at my affiliate links. There might be some fun ideas on sale for your sewing and quilting friends too! The Limited Edition of the Jolly Box surprise box is on sale at Fat Quarter Shop! What a fun way to give yourself a gift, put it under the tree and be surprised at what Santa brought! There’s only a few days left to get the Basic of the Month, Moda Muslin Mates at 20% off. Today, on Black Friday, customers can save big with 20% OFF ALL ORDERS at Fat Quarter Shop! Plus orders over $50 will receive a White Kona Cotton Solids Charm Pack as a FREE gift! And orders over $125 will also receive a Limited Edition Black Friday Grab Bag! Quantities are limited, so act fast! Be sure to check the Flash Sale Friday starting at 6 AM for some super special deals! These sales end Saturday, November 24 at Midnight CST! 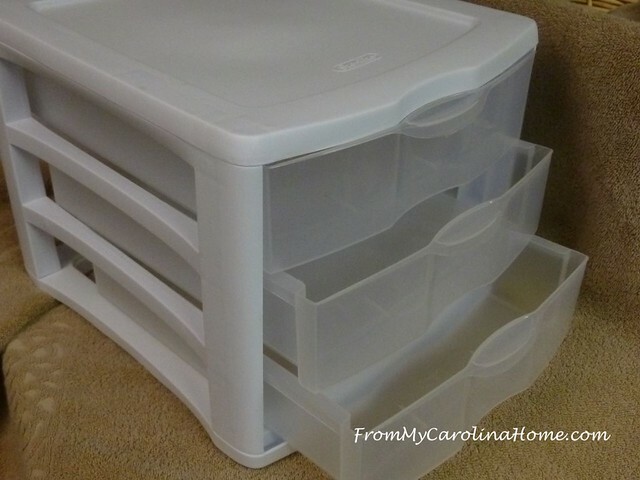 I never pass up on storage containers, particularly ones with drawers. They are wonderful for sorting my crafting supplies and stamping stuff. I found this one for just a couple of bucks, and it will hold a lot of threads. Save Up To 30% On Craft Supplies at Craftsy.com. Find great deals on the supplies & tools you need for next project. Save Up To 35% On Quilting Project Kits at Craftsy.com. If quilting is your happy place, pick up a kit to keep you there awhile longer. There are also great sales in progress on quilting and sewing supplies including fabric, knitting and crochet supplies, and free classes. 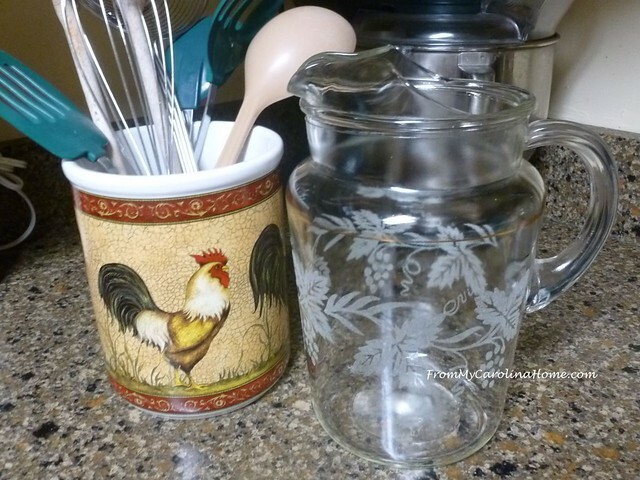 At the Safelight Thrift store, I scored a wonderful crock with a rooster design for the kitchen. I wanted something shorter for my utensils than the pitcher I have used for many years. That pitcher was my grandmother’s, and she used it for iced tea every single day for years and years as far back as I have memory. When she passed away, I kept it. There is a tiny crack in the handle, so I don’t want to use it for tea, but it will be displayed in the library as there is no way I can part with it. Enjoy 50% Off All Holiday Season! Sign up for a Bluprint subscription today, and they’ll automatically take 50% off the full price of your Craftsy items every time you shop from now until December 31. Offer valid at myBluprint.com through 12/25/18. 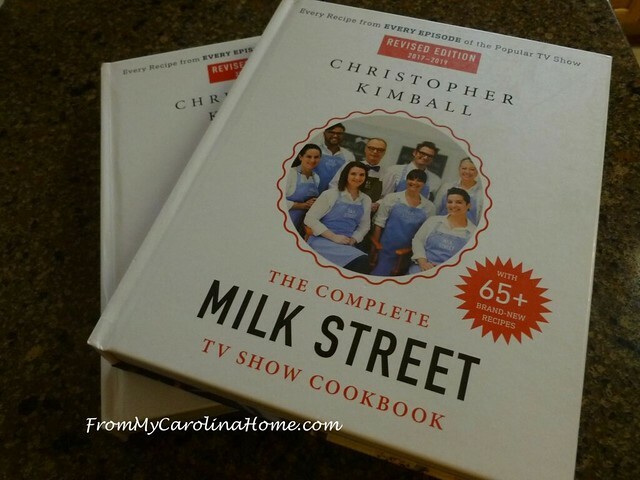 The Complete Milk Street Cookbook is on sale at Amazon with all the recipes from the first two seasons, regular price $40, on sale now for $25.47!! I love this cookbook, and have one to keep and one to give as a gift to a foodie friend. It has a Kindle version too!! If you’ve thought about a Kindle for Christmas, Amazon has the Kindle Paperwhite on sale. DH has that one and likes the easy reading screen that looks like an actual book. If you already own one, check out Kindle Unlimited with unlimited access to print titles, popular magazines and audiobooks across your devices for just $9.99/month. My last mission was to find a book stand, and I got one in Daytona. 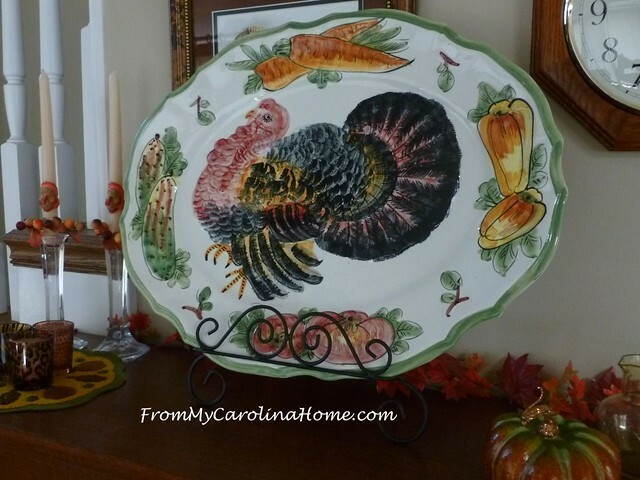 I like to display my turkey platter so I can enjoy it for more than just one day, but I have misplaced my large plate stand. A lovely black iron book stand fit the big platter well, so I could enjoy it for most of the month. Have you been to your local thrift store lately? Are you starting your holiday shopping this weekend? That is such a lovely memory of your grandmother. So glad you have her pitcher. Thank you for sharing. I like that on the day most of the country is shopping new, you’re talking about reusing what’s already out there. Our daughter only buys clothes from thrift stores (or sews them herself) in an effort to not support foreign sweatshops. My daughter is a thrift shopper, and really finds some amazing things. I am rarely successful when I go to a thrift shop, but I’m learning! How do you store all of your dishes? I’d love to have different dishes to switch out, but I don’t have the room to store them. Happy Thanksgiving to you and yours! That pitcher is a classic & a beautiful reminder of your grandma. I buy almost everything (even underwear!) at thrift shops…definitely the way to go. I am in the thrift shops at least 2-3 times a week. I also belong to a FB group that highlights weird secondhand finds. Sometimes they post about things they do in thrift shops and one posted that she and her daughter have conversations in the book area using just book titles. What a gas! I enjoy thrift stores, and have found they can be great places to replace a microwave! I can usually find a pair of jeans there when I need to replace a pair, and have picked up some nice dress boots as well. 🙂 We refuse to shop on Black Friday at my house, it just seems so not what Christmas is about. We do only a few gifts here, and lots of music, keeping it focused on Jesus and family. Thrift store shopping is multi-generational in our family, along with the requisite sewing alterations and mechanical fixes — but looking at your exciting finds makes me wonder if you have any tips for storage, especially for those seasonal items. Wow, I adore everything you found!! Yep, plastic containers with drawers are so great, I can slip a label inside so I know what is in there. I love containers. I am looking forward to your Japanese tablesetting. Your gramma’s pitcher is a treasure. I have some treasures too. Great scores Carole! I am also a thrift store junkie. It is a lot of fun to hunt around for treasures. I have a pitcher very much the same as your grandmother’s and I love using it in the summer months for tea and ice water. So pretty! You are s good at hunting out great bargains. Most impressed. 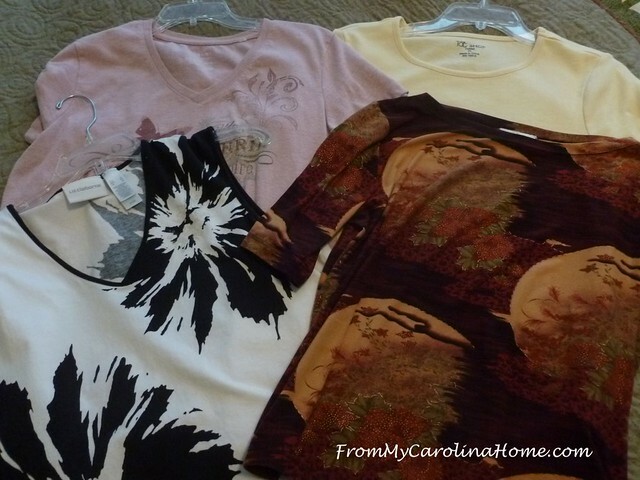 Great finds, Carole! Thanks for sharing at Vintage Charm!